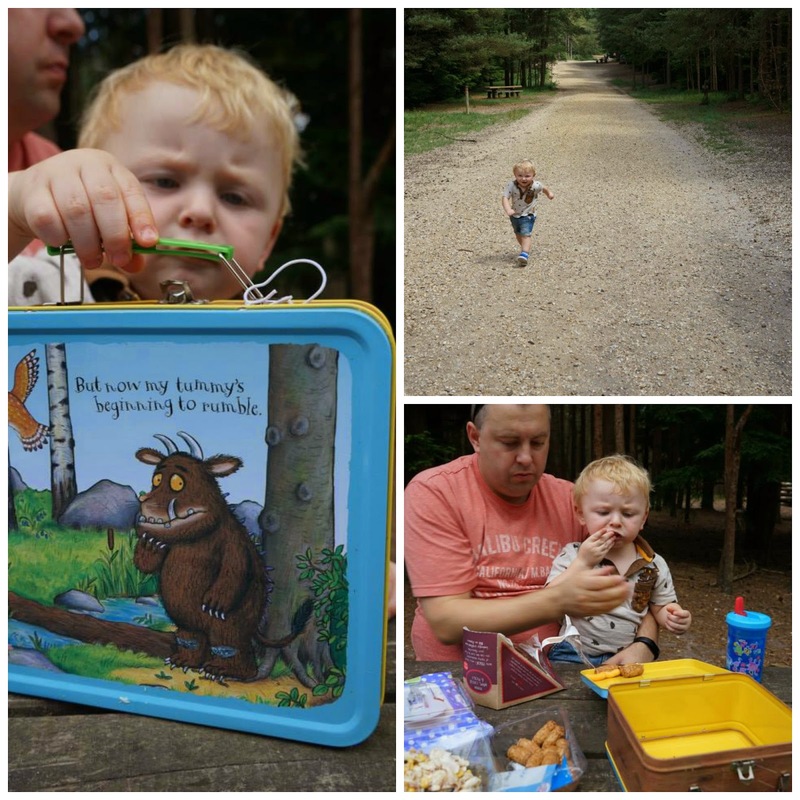 Entertaining Elliot: There's no such thing as a Gruffalo....or is there?! 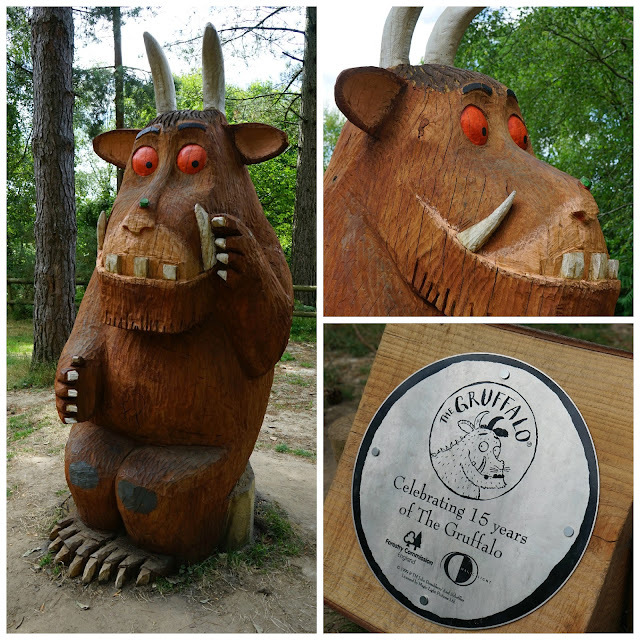 There's no such thing as a Gruffalo....or is there?! I bought Elliot the Gruffalo book when he was very young and he has always loved the story, and all the characters in it. He loves making the animal noises when prompted - his fox noise is hilarious!! He's got Gruffalo tshirts, a hat, an outfit, multiple copies of the book, a moneybox, height chart, wellies, slippers, a dinner plate....the list goes on! Yesterday we set off in search of the Gruffalo and had such a lovely day. 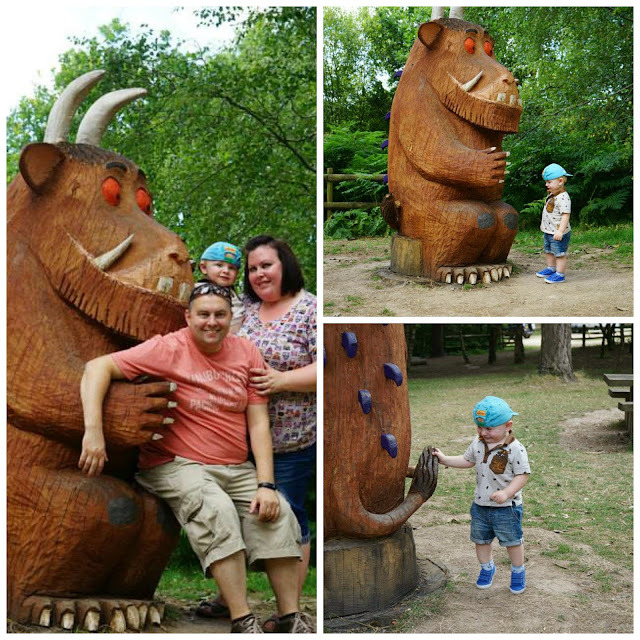 The weather was amazing, the park was lovely and quiet and we found the Gruffalo! Because the park was so quiet we took our time and spent lots of time exploring the playtrail. 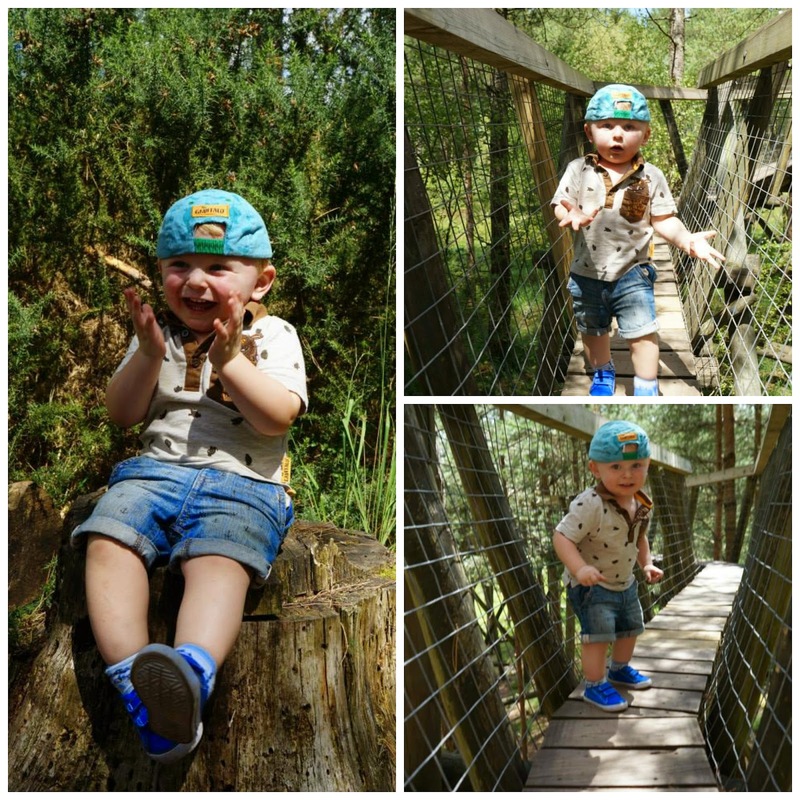 Elliot really enjoyed climbing up and down all the wooden play equipment - he was even brave enough to slide into a snakes mouth! There were only a few other families playing on the climbing frames but I can imagine it gets exceptionally busy here on weekends on school holidays. On from the Treetop Trail we took the "Lookout" walk which took us on a gentle stroll through the trees up to the highest point. 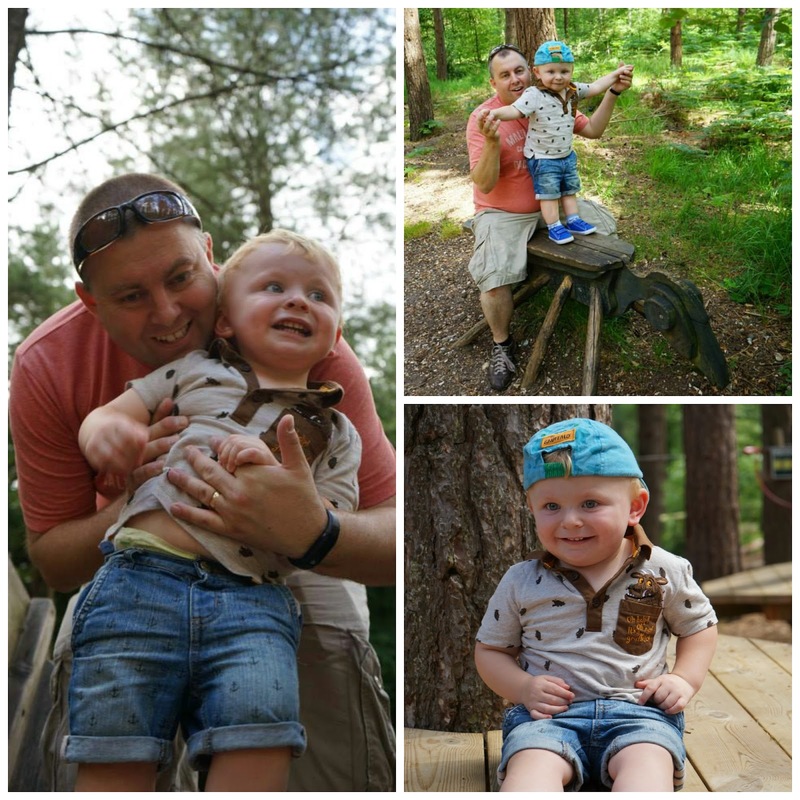 Bit bumpy with a buggy but Elliot loved clambering up the path! We found great views from the top and again it was so peaceful. Still no sign of that Gruffalo though! 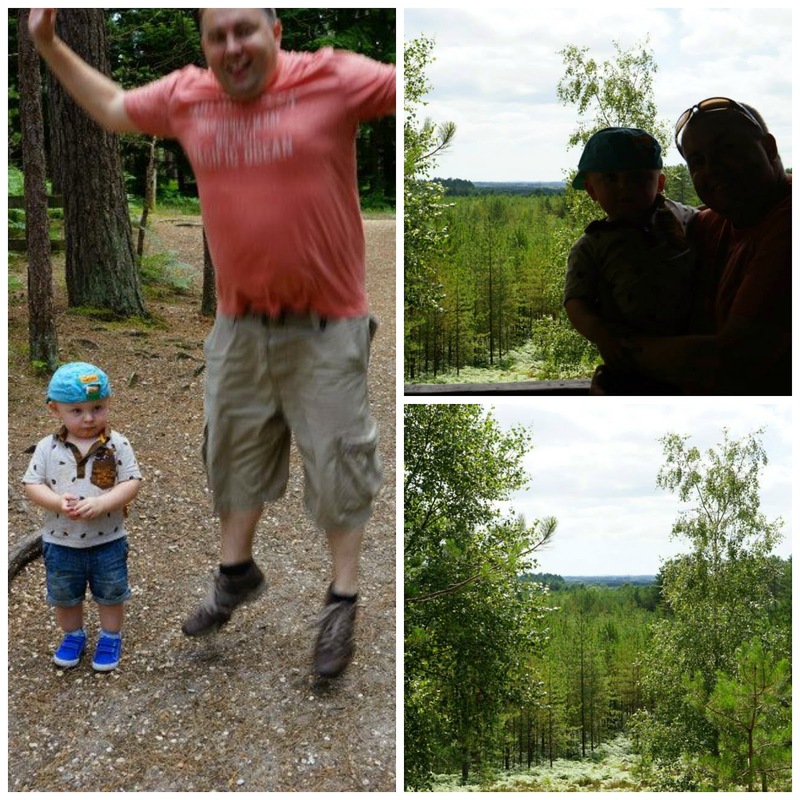 We didn't get a chance to go into the playarea as Elliot was still snoozing but Moors Valley have two great play areas, one for bigger kids and the other especially for little ones. Another thing to add to our list for next time! Just as we were beginning to think we'd never find the Gruffalo, we spotted him lurking in the picnic area by the Visitors Centre - yay we found him! Luckily, Elliot had also woken up by this point so he was able to see for himself that there is such a thing as a Gruffalo! The wooden sculpture was brilliant and really well done, he even has a poisonous wart at the end of his nose! Elliot was a bit unsure at first but soon he was happy to go right up to him and he spent ages running around gruffalo looking at his purple prickles on his back. 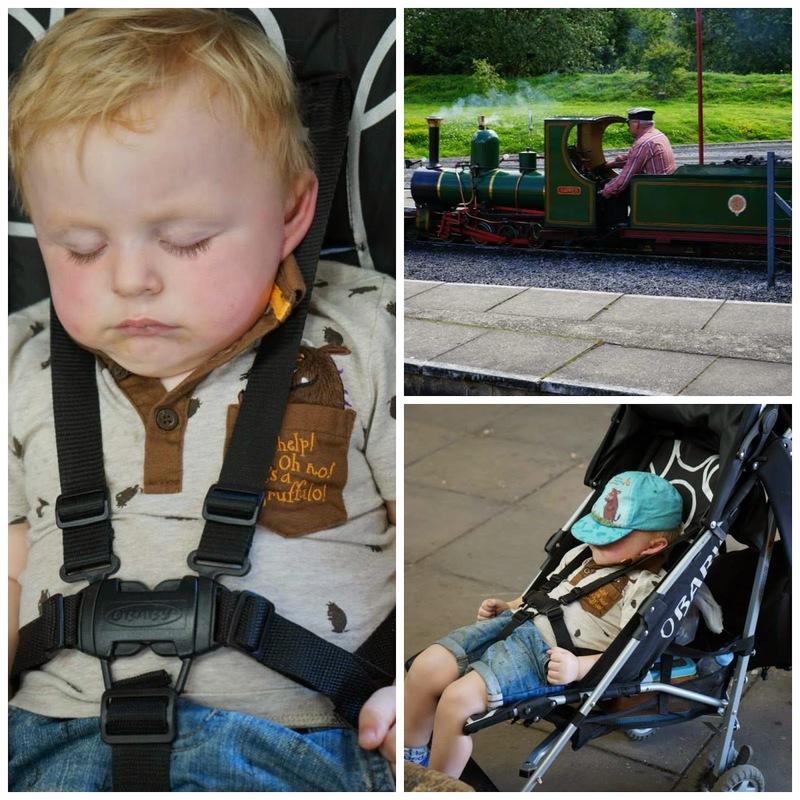 As the park was so quiet we were able to take lots of photos without feeling rushed and Elliot really enjoyed meeting his new friend! 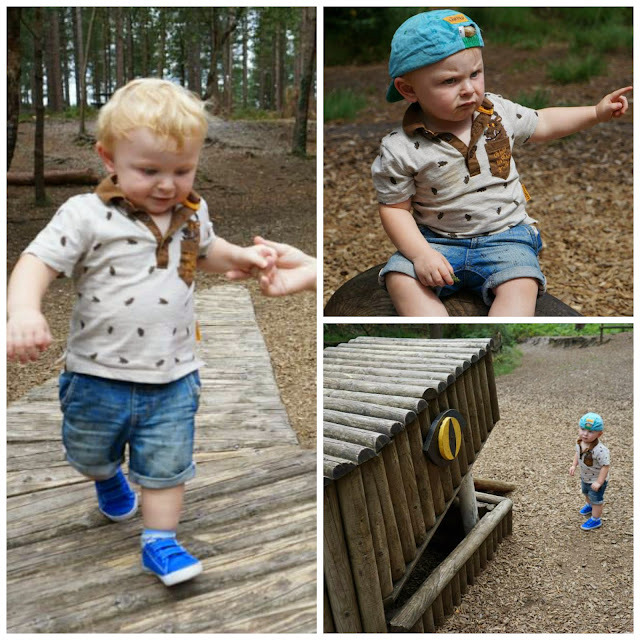 It's great there isn't it, Elliot loves stomping down all the paths and looking for gruffalos in the woods!